That Adorable Pet Bobcat Isn't "Showing His Love"
A video of a young boy interacting with a pet bobcat is making the usual internet rounds today (Update: More than 1 million have viewed the video). 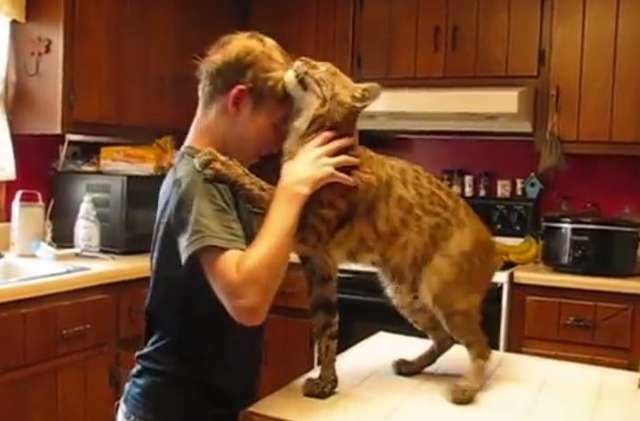 Titled "A bobcat showing his love," the video shows the bobcat rubbing its cheeks all over the boy, grabbing him playfully by the shoulders. We called up Carole Baskin, CEO of Big Cat Rescue, the country's foremost wild cat rescue organization, to find out what's really going on. Bobcats, like all cats, have scent glands in their cheeks which they use to mark their territory and property and deliver a variety of messages. The scent is undetectable to us, but to another cat, it's as clear as when you write your name in Sharpie on your lunch bag. "This bobcat is telling the world, this toy is my territory," says Baskin, "and I'm marking my scent all over this toy because I don't want any other bobcats to come along and take this toy away from me." Domestic cats cheek-rub their owners as well--isn't that a sign of affection? Well, no, says Baskin. "The cat is not showing affection for people, although we think 'aw, isn't that sweet.' They're telling other cats, this is my human, stay away from my toy, my provider of cat food, whatever the cat sees in that human in terms of benefit to the cat." Pet cats do show affection in lots of ways--slow eye blinks, presenting their bellies, physically sitting on or leaning against you--but the cheek rub isn't one of them. The difference between a domestic cat doing that to you and a bobcat doing that to you is, one of these days, not too far off in the future judging by the size of that cat, he's going to grab ahold of that kid's ear and rip it off, or rip his nose off, or tear his eyeball out, because bobcats are just that powerful and that enthusiastic. Not because he's trying to hurt the kid, but because that's how bobcats play. Bobcat breeders, typically involved in the fur trade, "take the cats before their eyes even open and bottle feed them to try to imprint humans on them rather than bobcat," says Baskin, but it doesn't really work. As with many wild animals, once a bobcat hits a certain age--around three to five years--it hits maturity and becomes a full-sized wild cat that can weigh up to 40 pounds, nearly the size of a Siberian husky, and will be immensely powerful. This bobcat isn't "showing his love." He's marking his territory, and his territory should probably watch out.